﻿ FAQs- Piña Colina Resort - Your Affordable Tagaytay Hideaway! 1. QUESTION: WHAT IS THE CHECK-IN AND CHECK-OUT TIME? ANSWER: Check-in time is 2:00pm and check-out time is 12noon the next day. 2. QUESTION: ARE WE ALLOWED TO CHECK-IN EARLY? OR CHECK-OUT LATE? 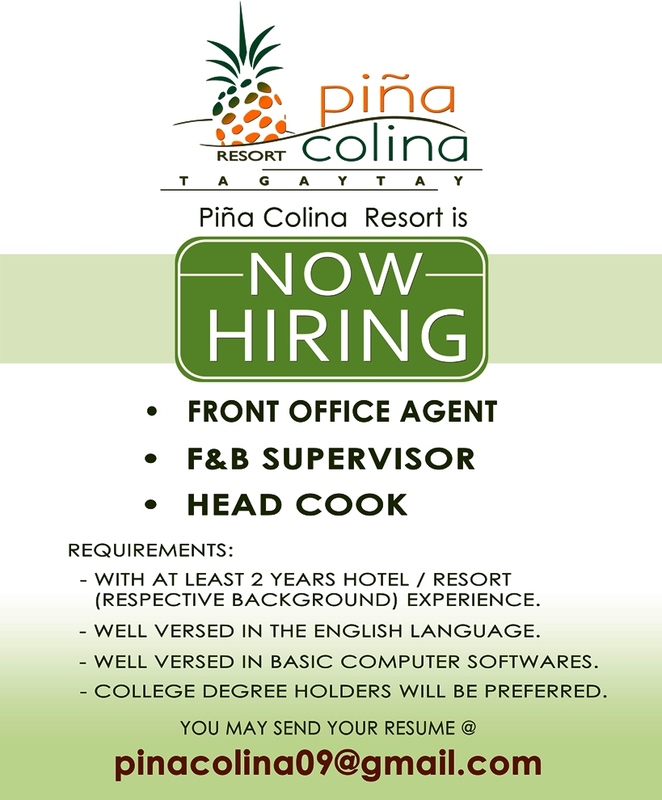 ANSWER: Because of Piña Colina’s high guest occupancy rates on high seasons, holidays and weekends, guests may only check-in to their units at exactly 2:00pm. This ensures that there’s enough allocated time for all units to be cleaned and furnished accordingly after previous guests have checked-out. On lean seasons, depending on the availability of your chosen unit prior & your booking date, guests may check-in before 2:00pm or check-out later than 12:00noon at an additional cost per hour. Guests may stay at the Dining Room, Picnic Area or Garden while waiting for the check-in time. 3. QUESTION: IF WE COME EARLY, ARE WE ALLOWED TO USE THE AMENITIES ALREADY? ANSWER: During high and peak seasons, guests may only start using the amenities, like the swimming pool, at 1:00pm. This ensures that every guest has as much private and gratifying time as possible during their checked-in duration at Piña Colina. On lean seasons, depending on the number of guests prior to your check-in time, guests who arrived well before the check-in time may already use the resort’s amenities. It is advised to contact our office a day before your arrival date, to be informed of our guest volume status. 4. QUESTION: DO YOU SERVE FOOD AND DRINKS? ANSWER: The Dining Room, our café restaurant serves breakfast to dinner. It’s open from 7:00am - 9:00pm. 5. QUESTION: ARE GUESTS ALLOWED TO BRING IN FOOD AND BEVERAGES? 6. QUESTION: WHAT ARE YOUR RULES REGARDING ALCOHOLIC BEVERAGES? IS THERE A CORKAGE FEE? ANSWER: Guests may bring in alcoholic beverages corkage-free. Nonetheless, drinking, partying, games or any loud activities are not allowed inside & within the units. REPEATED INCOMPLIANCE WILL RESULT TO EJECTION OF THE GUESTS. There are DESIGNATED AREAS within the resort in which the before mentioned activities may be carried out, albeit, not obstructively. Checked-in guests are free to use tables at our Picnic Area, Cottages, Sundeck and Dining hall (unless other arrangements have been made). 1. QUESTION: CAN THE PARTICIPANT USE THE POOL UNTIL MIDNIGHT? ANSWER: You may use the pool until 11pm to give way to regular maintenance and water treatment. By doing this at night, this ensures that all adverse effects from the chemicals have already dissipated by the time the pool opens at 8am the next morning. 2. QUESTION: SHOULD WE BRING TOILETRIES / TOWELS OR SUCH ARE TO BE PROVIDED BY THE RESORT? ANSWER: Towels may be provided upon requests / availability. Toiletries are not provided. However,guests may purchase them at Piña Colina's convenience store.